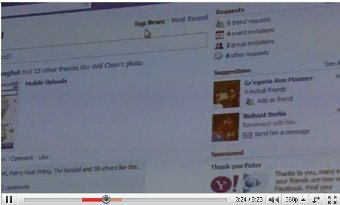 Mashable has posted a video of a meeting where Facebook Product Manager Peter Deng highlights the new Facebook redesign. The meeting was a private chat where Facebook invited “engineering students and select members of the press to chat with Facebook’s team, including Mark Zuckerberg, COO Sheryl Sandberg and Mr. Deng. The video doesn’t go into indepth details about the redesign, but you do come away with a much better sense of the changes, what they mean, and where those changes are.